Legare Waring House wedding in Charleston is full of gorgeous gold and pink details, a beautiful ceremony on the avenue of oaks, and a spring rain shower that didn’t dampen this couple’s day! Sarah and Tyler’s wedding was on April Fool’s Day, and it was a breezy and comfortable afternoon with the Spanish moss swaying back and forth from the branches of the ancient oak trees. An alligator was relaxing in the pond and moved swiftly with a splash as Sarah and Tyler walked along the bank.Bistro lights were strung across their ceremony site by Lowcountry Entertainment at the end of the avenue of oaks, and they twinkled as a light drizzle began to fall as Sarah’s dad walked her down the aisle. Colorful umbrellas of varying sizes and heights popped up among the guests during the ceremony, but the storm held out until everyone was safely under the tent for the reception.Gold decor by MOD Events with taper candles twinkled at every table and slowly dripped to the bases of the candelabras as the guests ate by candlelight. 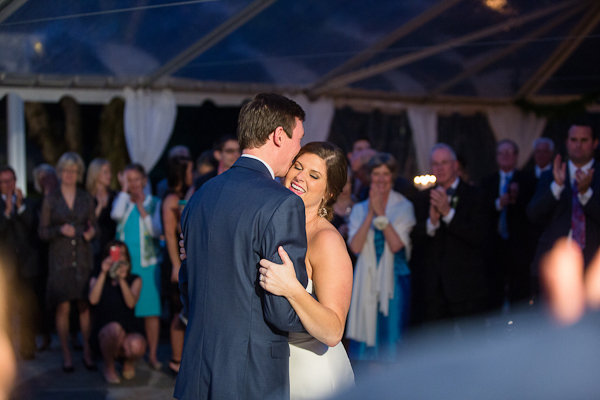 Sarah and Tyler’s wedding cake was made by their dear friend, and dinner included traditional southern fare including shrimp and grits. We're in love with their wedding decor. They used pattern plates, farm tables, candles and bright pink flowers. It's the perfect combination. The bride and groom took some shots under spanish moss trees. String lights were used throughout their wedding. It's so beautiful when they are all lit up. Charleston is such a dreamy place to say, I do.